After 3 months of pulking fun, we’re going to take a look at how the SkiPulk Fat Bike Pulk Kit has held up over the long haul. No pun intended! I’ve not only used the pulk kit for play but for bike-packing and actual work up North at my cabin. The SkiPulk has delivered 3 months of solid work performance in various conditions. My favorite use was off-road adventuring. It was an integral part of my Bivy Challenges in the winter months to help haul wood and gear to my campsites. I won’t lie; I will shed a few tears when I turn this kit in. But, I will definitely purchase one of these for myself in the near future. I will start saving my pennies for a few other items to add to it. In addition to the Fat Bike Pulk kit, I would buy 2 additional accessories. The first accessory to purchase is the Removable Fin Kit. The removable fins are made of heavy-duty aluminum. They help keep the sled on track in deep powder conditions and hilly terrain. They can be mounted on the pulk and moved inside the sled when not needed. The second accessory I would purchase is the Expedition Harness. The harness comes in handy if the snow gets too deep. It could be used to strap the bike to the top by attaching the poles to the harness. You can trudge on foot to your destination. Being stranded with this setup is really not possible. I have used this pulk in numerous winter conditions. Icy lakes, deep powder fields, single track, double track, gravel roads, and even some groomed snowmobile tracks. It handled exceptionally well in every environment. I was a little hesitant using it on my carbon seat posts at first, but, Grant from SkiPulk assured me that others have used their carbon seat posts with no issues. He was correct. I made sure to tighten the bolts slowly to so I didn’t cause any damage to the seat post. No issues at all. I really liked using this pulk setup ice fishing on the lakes. Not only can you haul all of your gear, but you get some very strange looks. Be prepared, you will get asked lots of questions by the locals. Nothing is more fun than pulling up to a flannel-clad Wisconsin ice-fisherman and asking if you can poach one of his holes. I have done this in the past but now with a setup like this, you can actually haul out your own auger. You don’t have to be a hole poacher any longer! I recommend studded tires when gallivanting around on the ice to avoid sliding out of control. Another great use for this pulk was grooming some of the local single- track trails for my local biking group. The weight distribution felt really good and the pulk was stable and tracked really well. It glided effortlessly with a full cooler and 2 cases of beer for ballast. The durability of the poles was outstanding, despite carrying a heavy load and falling on a tricky technical section of trail. The poles did not snap. Instead, the poles bent and held up beautifully. I did find by crossing the poles it made the Pulk track better behind the bike in single-track conditions. It doesn’t seem to sway off course at all. The most entertaining thing I did with the SkiPulk was to use it as a mobile Bloody Mary Station at the Sweaty Yeti Fat Bike Race at Levis Mounds, in Neillsville WI. I loaded up all the fixings and pulled it around the course and convenient stops for “racer aid and support.” It was a hit. The only drawback that I could find to this entire system is the weight of the hitch. The hitch weighs in at 2.5 pounds of stainless steel. But that is not necessarily a bad thing. It is bombproof. It is definitely what I would want if I were crossing Antarctica. If you are being a weight weenie with a thirty-pound fat bike hauling 100 pounds of gear, then you have other issues you may want to address with a professional. I wish the plastic sleeve around the hitch was a bit longer so it covered the entire contact point, but that’s all just cosmetic. This will not affect the system in any way. The thickness of the plastic sleeve makes sure the metal hitch portion will not scratch the finish on your seatposts. Big thanks to Grant and Ashley from SkiPulk, and Uncle Gomez for setting me up with 3 months of pulling goodness. This fat-bike pulk kit has performed admirably and held up to a lot of abuse. 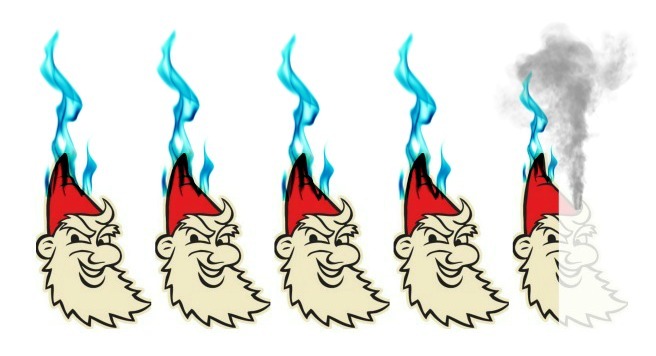 I give it a healthy 4.5 /5 flaming gnome rating!